Six of the 10 Senate Democrats on the committee that will consider confirming Betsy DeVos—President-elect Donald Trump’s nominee for secretary of education—attended private or parochial schools, or have children and grandchildren attending, according to information obtained by The Daily Caller News Foundation Investigative Group. 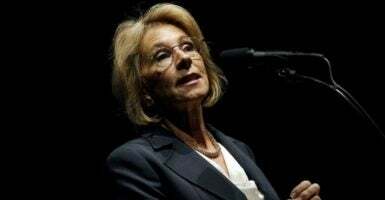 That inconvenient fact complicates the prospects for the National Education Association and the American Federation of Teachers, which have vowed to defeat DeVos, a longtime school choice advocate from Michigan. DeVos was the architect of Detroit’s school charter system and formerly led the Alliance for School Choice advocacy group. She headed the American Federation for Children—which backs school choice for poor and underprivileged families—when Trump nominated her. Trump called school choice “the civil rights issue of our time,” especially for African-Americans, during the 2016 presidential campaign. Among the Democrats on the committee who never attended public school are Sen. Robert Casey Jr. of Pennsylvania, Rhode Island’s Sen. Sheldon Whitehouse, and Colorado’s Sen. Michael Bennet. NEA and AFT together have given more than $60,000 to Casey’s campaigns over the years. Whitehouse said during a 2012 Senate debate that he sent his children to private school because he wanted “the best education that I can for them, and I felt that, in their circumstances, the places that I chose to send them were the best schools for them,” as The Daily Caller News Foundation previously reported. Sen. Maggie Hassan received $10,000 from the NEA in 2016, and the union also independently spent $1.5 million against her Republican opponent, Sen. Kelly Ayotte, according to the FEC. AFT also spent $4,400 to defeat Ayotte. Sen. Elizabeth Warren’s granddaughter, Otavia Tyagi, attends the trendy Harvard-Westlake School in Los Angeles, California. Westlake alumni include such Hollywood stars as Shirley Temple, Candice Bergen, Jamie Lee Curtis, Douglas Fairbanks Jr., Bridget Fonda, June Lockhart, Myrna Loy, and Tori Spelling. Educator Frederick Hess, author of “Cage-Busting Teacher” and “Education Unbound” called it “hypocritical” for elected officials who benefited from private schools to deny the same opportunity to others, especially those from economically less privileged neighborhoods. None of the six senators responded to The Daily Caller News Foundation’s request for comment.